Does the Universe only exists when we're looking at it? Many believe that the Big Bang theory and the discovery of God particle have confirmed creation out of nothing. But that's not how the story ends. 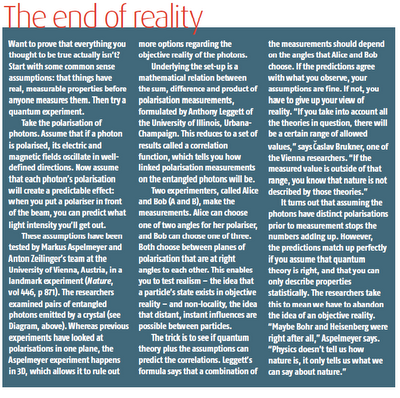 "To track down a theory of everything, we might have to accept that the universe only exists when we're looking at it" - Michael Brooks, New Scientist. This is about what science is and how it should be taught. We need to abandon the notion of an objective reality. "So does the universe exist independently of measurements? That is a question we will have to face. May be it is time to revisit Einstein’s lost quest, if we are serious about uncovering the basic laws of the universe; the money spent on particle smashers such as the Large Hadron Collider certainly suggests we are. Perhaps we need to move quantum entanglement and the nature of reality to the centre of the quest to find a theory of everything. What was once a quirky side show may yet prove to be the main event." The answer to the question "where do we come from?" not only lies on particle smashers but also on quantum entanglement and the nature of reality and drastically changes our view on science. Science is not a description of an objective world of things independent of human minds instead it is just a set of predictive rules to predict the possible values that we can assign to a physical system and it cannot in any way claim anything on the nature of the physical objects itself. Are you satisfied with viewing science as a set of predictive rules or do you prefer to see science as a description of an objective world of things—in the case of particle physics, tiny, scaled-down things? What problems are associated with each point of view? 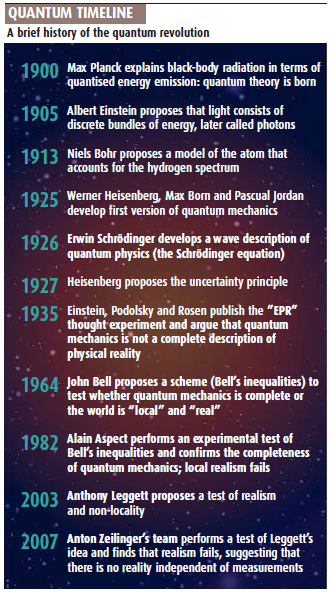 - Modern Physics - Serway, Moses and Moyer. This is what should be taught and there are serious problems or you'll get into lot of troubles if you view science as a description of an objective world of things, physicists don't have an objective account of reality. It is the business of science to explain an objective world as it is independent of a human mind but physicists just don't have it and other branches of philosophy which can give an objective account of reality should be considered very seriously. This lecture by David Mermin sums it up quite nicely. Now you replace those Red and Blue color properties with the property of an object called the spin, say spin up and spin down and those A, B and C with the X, Y, Z spin components of an object then as Mermin shows these properties cannot exist in prior to the measurements and the observed correlations are infact instantaneous. 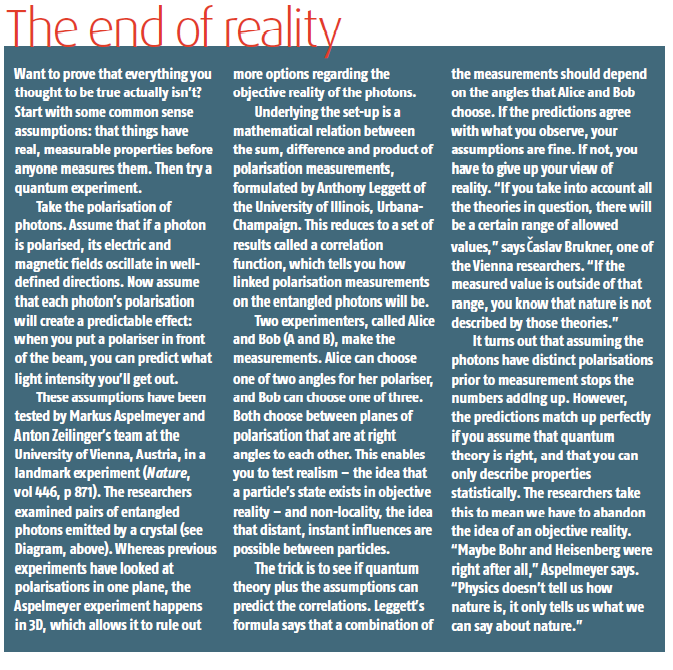 Its not that one physicist was right or the other one was wrong but instead their intellectual arguments and facts established from experiments have concluded that we need to abandon the notion of an objective reality. Einsteinian realism or the commonsense view of the world is simply unattainable. As Bohr says "There is essentially the question of an influence on the very conditions that define the possible types of prediction regarding the future behaviour of the system". According to Bohr the polarisation of a photon is an idealistic concept extrapolated from the results of our observations and no greater reality should be attributed to it. There is no element of physical reality corresponding to a physical quantity and Einsteinian objective world or his mathematical realism is just isn't out there. What ever is out there science cannot know what it is. "Unless we discard altogether the very idea of reality that is independent of our knowledge, we have to accept that such a reality cannot be identified with the ensemble of phenomena. This in turn means that we cannot escape what I claim is the fundamental distinction between reality in itself or as such - reality independent of the human minds - and the ensemble of phenomena - or empirical reality. As we shall see, this distinction is not for the use of philosophers alone. Scientists seeking to understand in depth the nature of certain debates internal to the scientific community will also find it useful." Bernard d'espagnat nicely puts it this way that "what we call empirical reality is only a state of mind". Okay, I still get nervous with it…. that there’s no real problem. Scientists are simply quite hesitant to state the obvious the universe is inevitably anthropocentric. Only God can give an objective account of reality.